St. Paul exhorts us to “pray without ceasing” — a beautiful goal that sounds daunting, even impossible. But wait! These pages break open an authoritative, time-tested method that countless laymen still use today to pray with constancy and thereby soar to the heights of holiness. It’s called the Liturgy of the Hours. Also known as the Divine Office or the breviary, the Liturgy of the Hours is an important vehicle for advancing in the spiritual life — a step that any serious Catholic, with the help of Fr. Timothy Gallagher, can take today. Relying on insights from popes and saints, as well as on his five decades’ experience praying the Liturgy of the Hours, Fr. Gallagher opens your eyes to this spiritual treasury and shows you how, by means of its sanctifying rhythm, it will help you progress on your spiritual journey. Soon, you will be among the multitude of Catholics who pray the Hours daily and are richly blessed by the flow of graces these prayers yield. 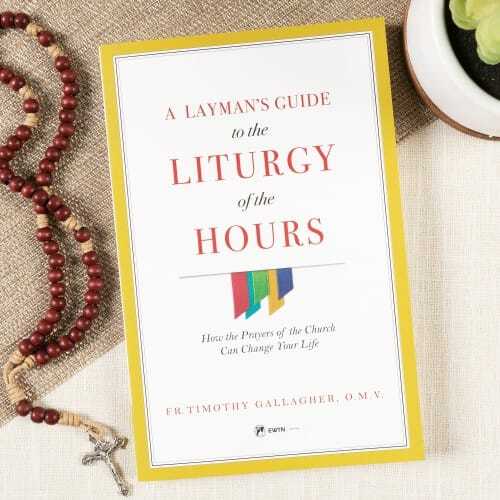 If you’re looking to invigorate your prayer life and draw closer to Our Lord in friendship and holy contemplation, discover the Liturgy of the Hours.